To me it’s hard to accept that they took the burn-in. I would sue for that, or at least demand an apology and effort to promote your photography (Which they used royalty free). Hey there… I do have a slide at the end with all of the places I have taken the photos from/credits (at least those that were not my own)… if that is not enough, please accept this an an apology and I’m happy to not use it – I have many others of Avinash (he’s a friend). You know where to find me if you would like to discuss or if you would like to continue the conversation. As I say in the title, and in the first sentence: of course I won’t sue and it’s an honor that you use my image! So please keep it in there. And for me an ending slide with credits is enough. And it’s something I often do myself. Because of the fact that credits in the slides are distracting. I just wanted to spark a discussion. What do other people think? And, is it wrong use of the CC license to sum up credits at the end? Probably not. If you have a look at my recent images on Flickr I have removed the credit burn-in. Because I think it destroys the image. 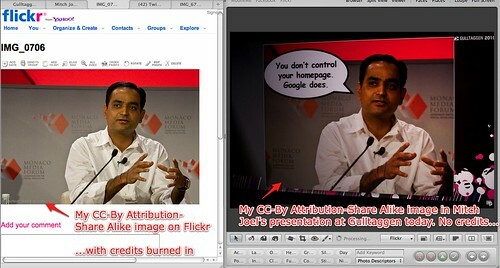 Here’s an example of how I credit external works in a presentation. I research for print and then it’s never really a problem (picture captions, credit list in the prelims, or endmatter), but I would just like to add here that there is no point in suing, really. Did some work for Getty Images a few yrs back and it’s really hard to settle disputes re images that have been nicked from somewhere. Having said that, it’s in breach of the CC licensing agreement and I would certainly ask for some form of compensation. Just noticed that he did credit you at the end somewhere…I have to say that I think what he did was okay, then!